투습 방수 사양의 쇼트 라이딩 부츠. 손톱·측면·복사뼈에 각각 플라스틱 슬라이더를 장비하는 스포츠 라이딩 대응의 방수 라이딩 슈즈입니다. 슬라이더가 특징적인 스포츠 라이딩 사양. 굽 있는 솔에서 라이딩에 최적입니다. It is short riding boots with moisture-permeable waterproof specifications. 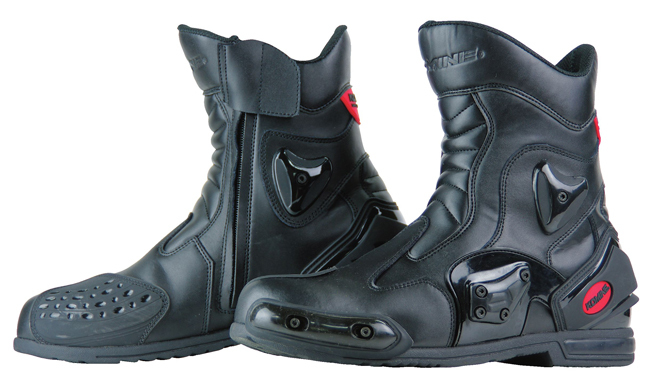 It is a waterproof riding shoe for sports riding and it is equipped with a plastic slider on each toe/side/ankle. It is a sport riding specification with a distinctive slider. It is perfect for riding in a heeled sole. *The size of the product on the photo #4 to #9 is 27.5cm. * 사진의 사이즈 표에 대해서는, 크기" 단지 근사치입니다.사이즈 정보는 제조업체가 제공하므로 오차가 있을 수 있습니다. * 재킷:가슴과 하단의 치수는 제품의 실제 치수입니다. 따라서는, 표기된 사이즈가 더 클 수 있습니다. 사이즈는 신체의 대략적인 측정입니다. * 팬츠:허리, 엉덩이와 가랑이는 제품의 실제 외부 사이즈입니다. 따라서는, 표기된 사이즈가 더 클 수 있습니다. 사이즈는 신체의 대략적인 측정입니다"
i just receive my shoes from webike affordable and good brand shoes the fitting is same as any ordinary shoes so its easy to ware and 100% accurate size fitting. This boots are awesome! The comfor and protection is excellent. Practical design makes it easy to put on and take off. Makes riding my sports bike much more comfortable. Protector is a lot of exterior appearance. "Tangyu" Feeling, at the beginning it was hard and Clutch could not easily connect, but I was impatient, but I got accustomed to it gradually. What is it because it is beginning to wear, but COSPA is also good, I think it feels nice.